Protein Blend (Whey Protein Isolate, Whey Protein Concentrate, Whey Peptides), Xanthan Gum, Natural and Artificial Flavors, Lecithin, Sucralose, Stevia Leaf Extract. Protein Blend (Whey Protein Isolate, Whey Protein Concentrate, Whey Peptides), Dutch Cocoa Powder, Natural and Artificial Flavors, Chocolate Chips (sugar, unsweetened chocolate, cocoa butter, soy lecithin, natural vanilla extract), Lecithin, Xanthan Gum, Sucralose, Stevia Leaf Extract. Protein Blend (Whey Protein Isolate, Whey Protein Concentrate, Whey Peptides), Natural and Artificial Flavors, Dutch CocoaPowder, Lecithin, Xanthan Gum, Sucralose, Acesulfame Potassium, Stevia Leaf Extract. Protein Blend (Whey Protein Isolate, Whey Protein Concentrate, Whey Peptides), Natural and Artificial Flavors, Xanthan Gum, Lecithin, Sucralose, Acesulfame Potassium, Stevia Leaf Extract. Protein Blend (Whey Protein Isolate, Whey Protein Concentrate, Whey Peptides), Lecithin, Xanthan Gum, Natural and Artificial Flavors, Sucralose, Stevia Leaf Extract. 24g of protein from a unique whey protein blend that uses whey protein isolate as its primary source, which is among the purest forms of protein available. The high biological value and quick absorption helps you to reach the next level. With 5.5g of naturally occurring Branched Chain Amino Acids (BCAAs) and 4g of Glutamine and Glutamic Acid, muscle recovery is not an issue. 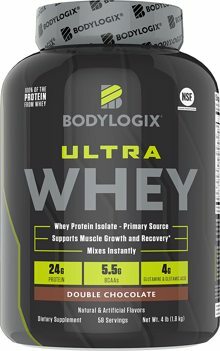 Bodylogix Ultra Whey is held to the same high-quality standard as all Bodylogix products and only contains ingredients that you will find on the label and nothing else so you know you are getting exactly what you pay for. Bodylogix Ultra Whey is produced in a GMP registered facility and are NSF Contents Tested & Certified. This ensures that every bottle of Ultra Whey meets the highest safety and quality standards and that all claims and information on the label is accurate. 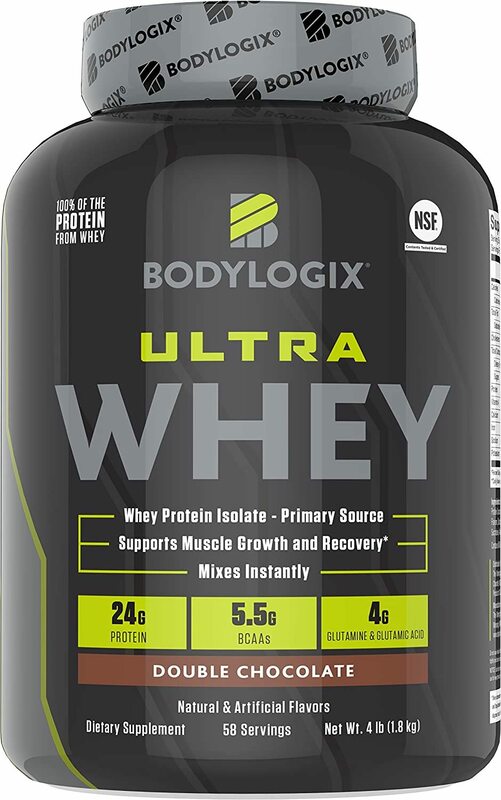 With clinically studied ingredients, Bodylogix Ultra Whey is designed to help you get the most out of your workout and to support you to reach your performance goals.